I didn't get ANY shots of me this week. My friend did take pictures at the baby shower so I will post some of those soon. What I miss? mmm life certainly is different but I am currently feeling so grateful for the experience of growing this little boy inside me. I cant think of anything I would rather be doing. What I love? Feeling baby move + the baby shower! BABY SHOWER! Our baby shower was on Sunday! It took a lot of work getting the house clean and hosting 60 people but it was so fun. 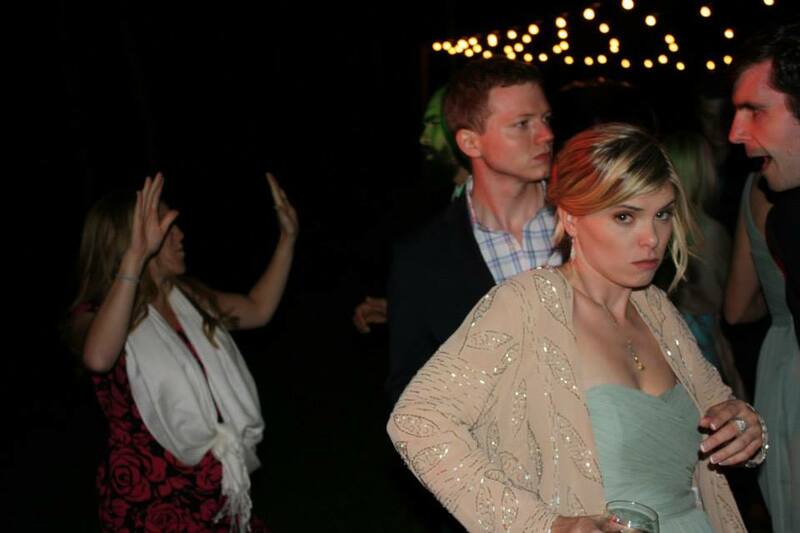 So much excitement and joy at the party. So much fun and good memories made. It was so good to see so many good friends and family. Not to mention baby boy got spoiled with gifts. We ran out of time and weren't able to open the gifts, I was having to much fun mingling so we took pictures of us ooowwwing and ahhhing at all the gifts we are so grateful for and I will be posting a blog post soon so guest can check out what we got. An hour before the baby shower I tried to take a nap and Tyler surprised me and came down and snuggled with me. It was really special. At night after the shower and opening the gifts we also just layed in bed together and talked about the future and the love we have for our growing family. It was a wonderful day I will never forget. We took our first childbirth class on Saturday. We are taking a Hypnobabies class. One of the reasons I am so grateful about this method of birthing class is how excited I am for my birthing time and the birth of my baby. I talk to friends who are pregnant doing a different childbirth class and with a different plan and many of them are terrified for the birth and want to be pumped with drugs. Each of us is different and we all get to choose the experience we want and I might change my mind at some point but right now I am so excited for the experience me and Tyler will have welcoming our baby into the world. It was really nice to share the childbirth class experience with Tyler. Symptoms? 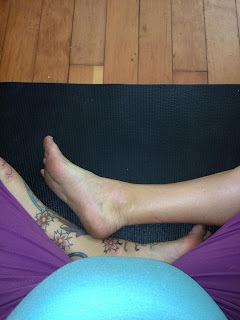 Swollen hands and feet, heart burn, cramps in calf's, tight muscles (back, outer hips, calf's) tired, emotional, getting a little short of breath (my OM chant is getting shorter and shorter and it is impossible to blow up a balloon). Exercise? I practice yoga 5x this week for 30-60 minutes. It has felt so good. I have noticed I have to more adjustments these days, for example really wide feet in uttansana and tadasana. I also did the elliptical 3x a week for 30 mins and made it to the pool for laps 1x. It does feel good to more my body. Current favorite movement to do is bend my knees place my hands on my hips and do big hip circles. I look like a food but it feels so good in my hips and low back. Mediation? Yes. It has been helping me stay calm and connect with my body and my baby. Appointments? I had a ultra sound yesterday and y placenta is still low and I will need another ultra sound in 6 weeks to check on the placement. Fingers crossed it moves up and I can have the natural vaginal birth at the birth center like I want and not get transferred to the hospital. However what is more important then what I planed is having a healthy baby. I have a midwife appointment on Thursday now I will be seeing the midwife every three weeks instead of every four weeks. very exciting! Upcoming events? We just completed the month of events! I feel like I can relax more. We do have child prep (hypnobabies) classes for the next 6 weeks. I had a request for expanding (inner) spiral for my class at Sugar Space. Inner spiral is a rotation that happens on the vertical plane that creates an expansion on the horizontal plane. In Anusara we incorporate heart qualities and feelings into the alignment based practice. In the beginning of today's class I encouraged my students to reflect on three blessings in their life for which they are grateful. So as they experience the expansion and widening that is created from the action of inner spiral they can fill themselves with the feeling of gratitude. At the end of the class I had them again think of three blessings either the same or new whatever came to mind first and I asked them to add themselves to the list. It was a great class. I had 2 students that were new to me and one of my students had a birthday so she demoed + rocked a handstand and we sang her happy birthday. 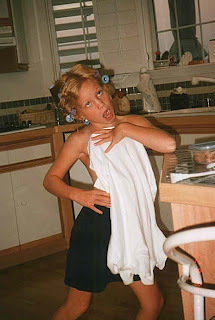 I found an awesome blog post at http://hopeave.wordpress.com/2013/07/29/how-to-talk-to-your-daughter-about-her-body/ about talking to your daughter about her body. It really inspired me. I think the information was so good and SHOULD/COULD be applied to everyone. Men and women, boys and girls, family members, friends, and strangers. I already make a point about not commenting on someones weight because you never know how those comments are feedings a body image issue or cultivating one. But I am so grateful for the blog I recently found for giving me even more ideas. Here is a list I compiled from her blog and from my own thoughts about how I think we should talk or should not talk to everyone about weight and body. Don’t say anything if someone lost weight. Don’t say anything if someone gained weight. Better yet, compliment them on something that has nothing to do with their body. Don’t comment on other people's bodies either. Not a single comment, not a nice one or a mean one. Don’t talk about how much you hate your body, or talk about your new diet. Buy healthy food. Cook healthy meals. But don’t say “I’m not eating carbs right now.” If we didn't talk like this we wouldn't cultivate the shame over what we eat. Shame about what we eat leads to shame about yourself. Encourage people to run because it makes them feel less stressed. Encourage people to climb mountains because there is nowhere better to explore your spirituality than the peak of the universe. Encourage people to surf, or rock climb, or mountain bike because it scares them and that’s a good thing sometimes. Remind people that the best thing they can do with their body is to use it to mobilize their beautiful soul. If you did just three of the things on this list religiously imagine how the world would change. I think it would shift us from looking through body conscious eyes to soul conscious eyes. You are BEAUTIFUL! Not becuase of the size of the jeans or the tone of your muscles but because you are YOU! Sadhana is the term for spiritual practice and literally means “that which takes you to your goal”. One of my goals is to experience less tension + more ease and life and therefore experience more happiness. Well I learn through Anusara Yoga that I can reach these goals through practicing alignment. Sadhana is something that I can practice every moment. So in every moment I can work on enhancing my alignment. The hope is to that the more you practice good strong alignment on the matt and off of it those muscles that hold you in good alignment will get stronger and your body will naturally start standing in better alignment with less awareness on your part. The problem is… it FEELS easier to stand with poor alignment. For example it seems easier to stand and roll the shoulders forward and let the head come into the front plan of the body (this posture is called forward carriage in physical therapy and comes with a whole host of injuries + pain + discomfort). So in the beginning it takes a lot of awareness and smart alignment action to retrain the body out of this “lazy poor posture” into a “efficient beaming with happiness posture”. Lazy poor posture -> leads to pain in the body “ouch my neck is tight and hurts” (not only will bad posture enhance old injuries it will cause new ones)-> which leads to pain in the mind “I have headaches all the time” -> which leads to UN-HAPPINESS -> which leads to not enjoying life because you don’t feel up to it… because your in PAIN! Good alignment -> leads to the body HEALING ITSELF (not only are you not accumulating more discomfort but you are healing past injuries and pain patterns) -> which leads to your body feeling TERRIFIC! -> which puts you in a WONDERFUL MOOD -> which leads to HAPPINESS -> which leads to wanting to enjoy all that life has to offer because you feel so GOOD! SO how cool is it that our spiritual practice can be watching our alinmgnet on and off our matt and working to make it as optimal as possible. Another cool thing about yoga is that lines blurr so easily. You start focusing just on your physical alignment to help cultivate more happiness in your life and then slowly with or without noticing it you begin to start noticing how your actions, thoughts, emotions line you up with happiness. Maybe you start to notice that a cigirate, or food, or shopping, or negative self talk, or gossipling or whatever it is, is not leading your to your goal of happiness. This was my experience I started praciticng yoga because my back hurt I wasn’t interested in a higher power, or my relationship with myself others or the world. But slowly the lines blurred. I got hooked and as a result my life is 100x healthier and I experience so much more happiness and ease as a result of looking at my alignment in all ways and forms. Open to Grace = Side bodies long: lengthening up through the sides of the torso and up through the sides of the throat, into the dome of the palate. Lift your chin to help create a natural lordotic curve in the neck. Expanding spirals of arms = when the arms are in the over hand plan like in down dog, handstand, pincha, Urdhva hastasana… the inner deltoids and arm pits broaden to the back plane of the body expanding around the neck. When they are in the lower plan like tadasana, cobra, bridge… the inner deltoids broad to the front plan of the body and continue to wrap around and to the back plan of the body creating again space around the head neck and shoulders. Shoulder Loop= Shoulder Loop reinforces the lordotic curve of the neck. It begins in the soft palate and curls the head back. The muscles of the back of the neck, from the base of the occiput flow down toward the bottom tips of the shoulder blades and into the heart. Skull Loop = it initiates at the soft palate and flows back toward the occiput, then lifts the back of the skull up and over the crown of the head. Organic Energy = there’s an extension from the active focal point first down into the earth and then up and out. From the back of the heart extend the arms out and fully straight. I have been noticing in class bent elbows so organic energy should straighten, but not hyper extend, the elbow joint. Virasana hands on shoulders elbows bent. Have elbows touch in the middle. Inhaling up exhaling down. 10X circles in each directions then 3x in each directions. Without taking a break take arms out to a “T” make firsts with hands and turn palms up and down flossing out the shoulder socket with the head of the arm bone. Take the arm in front of the body for a outer lat and shoulder stretch and then take elbow toward sky for a triceps stretch. What I love? Feeling baby move + nesting. My sister was in town for the week and it was really nice getting to see her. We have been crossing off a lot on the to do list for the baby shower. Tyler got the crib (still needs to be set up), got blinds (still need to be installed), I did lots of gardening, cleaned the house. 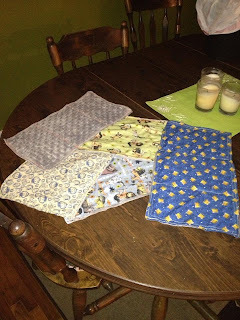 I started sewing! My nesting has turned to me needing to be able to sew awesome burp cloths, bibs and blankets. 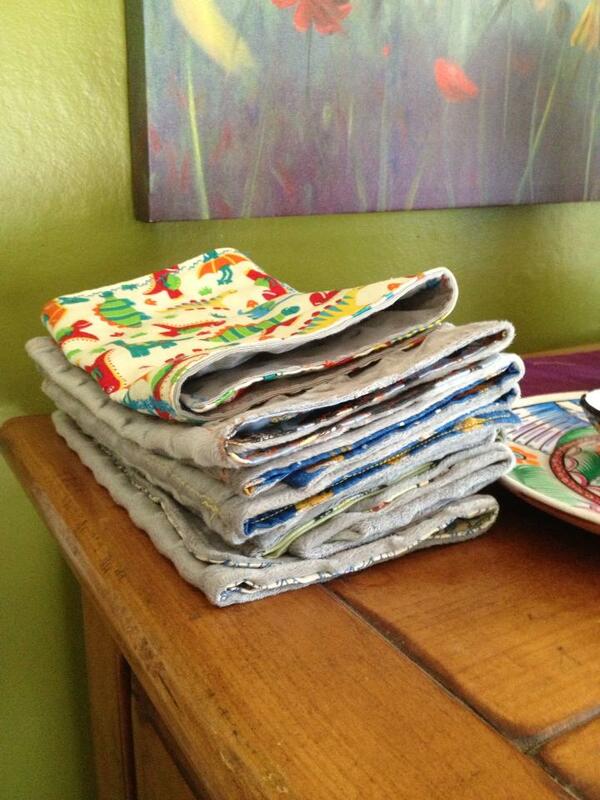 So far I have busted out 12 burp cloths! So fun!! 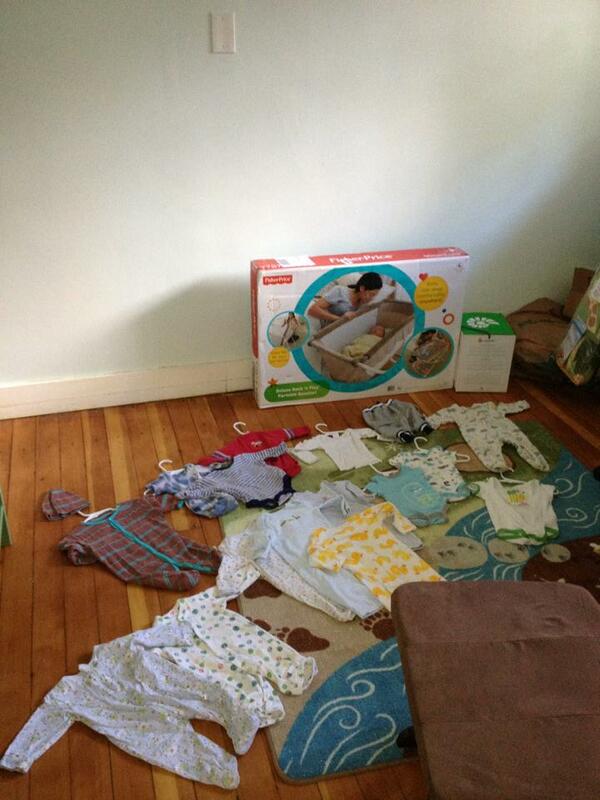 Its nice to feel like I am preparing for baby while sitting down. Went to a family members baby shower. I love being around baby excitement. Went to a good friends wedding. Symptoms? 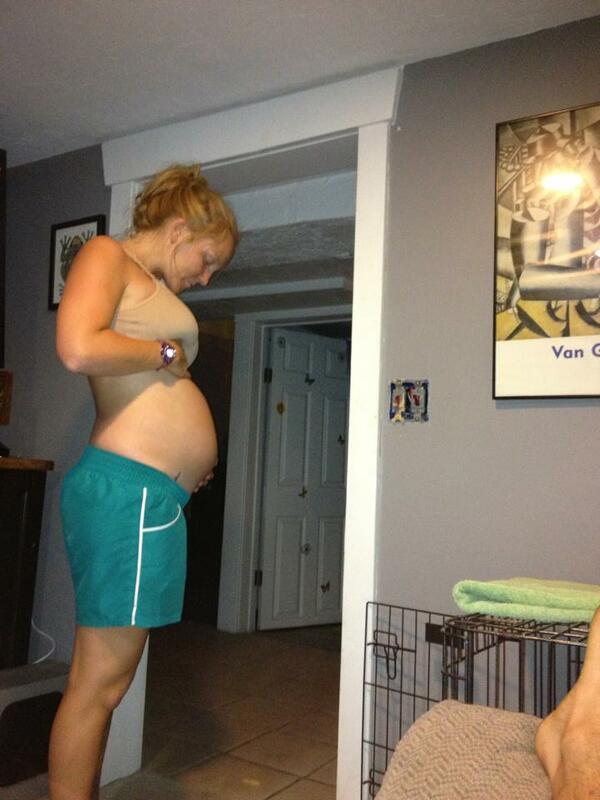 Third trimester symptoms are somewhat kicking my bum. Huge heart burn, leg cramps at night, horrible back pain. 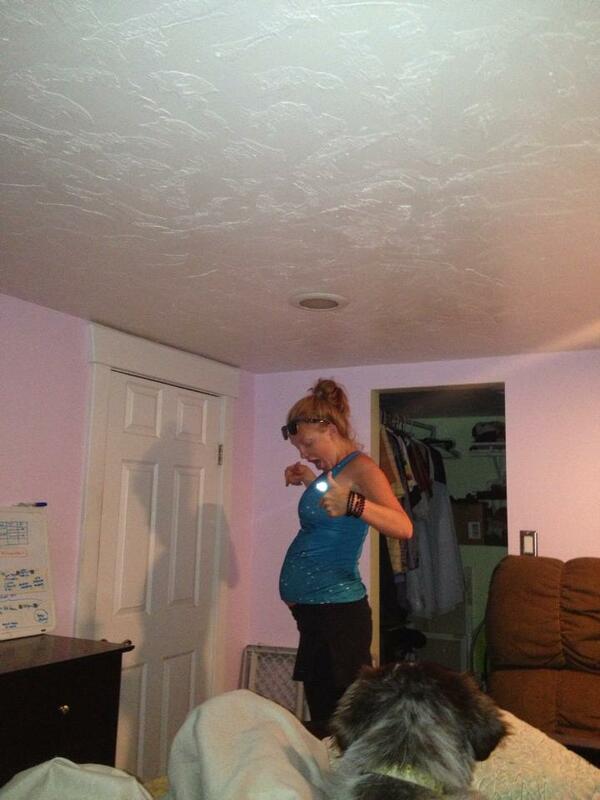 Huge baby movements :) excitement as we get closer to meeting this boy. Exercise? Elliptical, swimming, weights, and yoga. I go through phases with yoga. Some weeks it doesn't feel as good and my yoga practice is me sitting down and stretching or doing some gentle down dogs to relieve back pain. This past week yoga has felt really good. It has been nice to do a more then stretching. I have come up with a really juicy hip opening series. Appointments? We have a midwife appointment next week. Upcoming events? Our baby shower is Sunday! Ahhh nervous + excited. Here are some notes from the class I taught at Sugar Space on Saturday. (I teach at an Anusara-Inspired yoga class at Sugar Space every Saturday 9-10:30 by donations in SLC, UT). Strong leg alignment refinements leading to an open and a spacious lower back + yummy forward folds. One thing I love about practicing Anusara Yoga is the intention behind it. In classical yoga one of the main goals is to still the mind. In Anusara Yoga our main intention isn't to still the mind (but that does happen and its a great side effect) our aim is to get moments of recognizing ours elf as part of the Divine. We have a deep desire to know our self more fully (chit) and what we are at our essence is delightful and blissful. True we might not experience bliss all the time but if we look, turn with in, practice yoga asana... we will get glimmers of the light that shine through us. I know for me I can be having a horrible day totally caught up in little cares and dramas but after I practice on my mat I am reminded LIFE IS GOOD, that I am inherently good even when I make mistakes. I even leave my mat with a deeper appreciation for my sad darker days, because just like with light and dark we cant appreciate the light with out the comparison of it to the dark. I talked about this in class at Sugar Space. 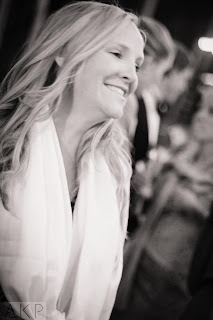 I asked the students to reflex on how they are feeling when they showed up to practice and to look for those "ah-ha" moments throughout class when the light shines through the clouds and they feel connected to source. At the end of the class I again asked the students to reflect on how the felt compared to when they came in and all the students felt better, more connected, and more plugged in after the practice. Enjoy the strong leg alignmnet work in this sequence and juicy forward folds. This class will cultivate openness in the hips + hamstrings while strengthening the core + legs to hold the new found freedom in the pelvis. It is very common for people to have strong and tight outer hips + thighs and weak inner thighs. This causes lateral rotation of the femur bones and tuns the feet out like a ballerina. This lateral rotation of the legs causes the low back to flatten causing tightness and discomfort. In this scenario the outer hips/thighs are tight and strong and the inner thighs are weak. It takes courage and willingness to look at our self. Both our physical poses as well as all parts of our selves to see where we can refine so we can become the best person we can be. 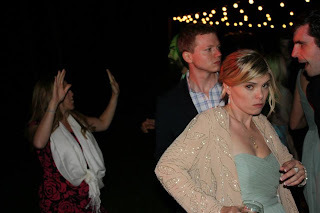 There I am in the back breaking out my sick dance moves at the wedding. 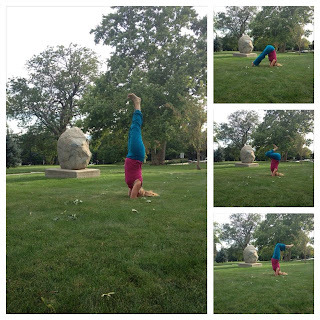 Headstand play at 26 weeks 5 days pregnant. The belly shot that so many people have been asking for 26 weeks 3 days. 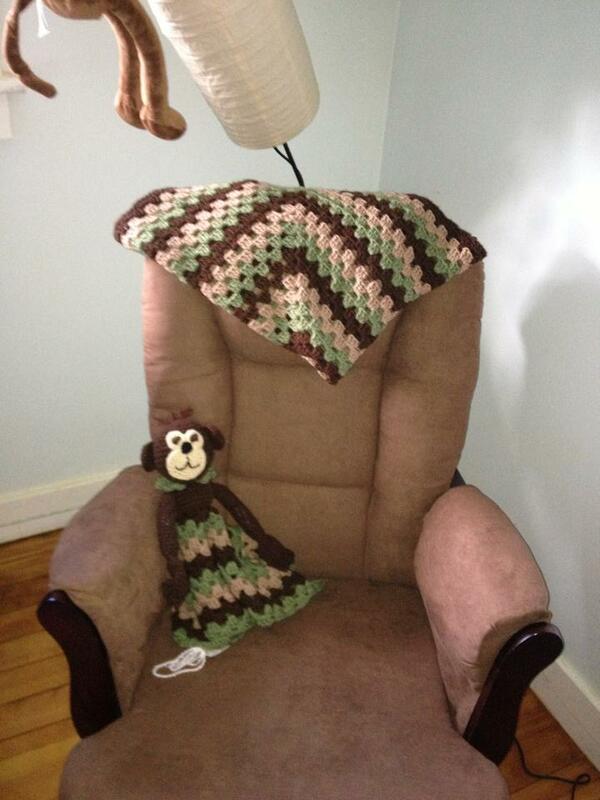 A yoga client of mine crocheted this fabulous monkey blanket and blanket along with matching booties and monkey hat (not pictured). Food I am craving? Mexican food, ice cream. What I miss? Absence of back pain. What I love? Feeling the baby move. Baby boy is moving so much now it is so exciting to just sit with him and think about the future. Best moments of the week? · My good friend Isabel got married in Deer Valley and we got a room up there for 2 nights. I got to see a lot of old high school friends that I haven’t seen in years + there was lots of excitement over my belly bump. I also had a great time with Tyler at the wedding. We got to be reminded of the vows we took and had some shared some pretty awesome dances. · It was our 4 year anniversary the day before Isabel got married and we went out to dinner and talked about our past, present and future. · We have been planning our baby shower and have started receiving gifts and have continued to put the nursery together which is so exciting. I will sit in the rocking chair in the nursery and think about how crazy it is that in 3 months I’ll be rocking my baby boy. · Tyler has also been killing it in house work. He has re done our baseboards, done electricity work, we are also having someone come in and redo our kitchen floor and a bathroom. It feels so nice for my long to do list to start getting checked off. Tyler and I also went to a free movie under the stars which was a really fun outing. Symptoms? Awful back pain, heart burn, uncomfortable, pregnancy brain and losing my graceful coordination. Exercise? Yes I have been getting at least 30 minutes of cardio (hiking, elliptical or swimming) 5x a week and have been doing prenatal strength exercises for about 10 minutes 5x a week. I have been doing 30 mins of yoga 2-3x a week. Meditation? Yes every day for at least 30 minutes. I aim for 2x 30 minutes but I don’t always get 2. After my midday meditation I have been taking a nap which has been very peaceful. Appointments? We had a midwife appointment last week which went great. I had my glucose test checking for gestational diabetes which I passed! Baby was measuring one week a head which made me happy for a while he was measuring one week behind. My midwife also recommended I get weekly massage appointments to help with my back pain. I have another midwife appointment in 3 weeks and after that I will see her every 2 weeks and I have another ultrasound to check on placenta placement in 4 weeks. Upcoming events? We have 2 wedding this weekend, one on Saturday and one on Sunday. Tyler starts school full time at Salt Lake Community College in the Welding program on Wednesday and we are having our baby shower/ open house the following Sunday. This busy month is making time feel like it is moving faster which is nice because it felt like time was moving so slow for a while. 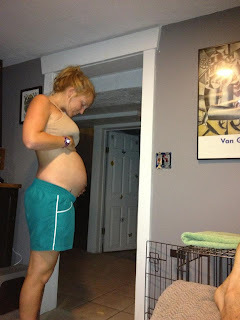 The end of the 26th week pregnant marks the beginning of the third trimester!!! less then 100 days til we meet our gorgeous boy.